Observer Infrastructure (Discontinued) | VIAVI Solutions Inc.
Master your IT Domain Deploy the multi-faceted vigilance you need to ensure network delivery of critical business services. Virtualization: What is the status of the VMs and hypervisor? Cloud: How do I manage internal and hosted infrastructure? Capacity management: Are your IT operations poised to handle increasing demands? Deep-dive application accessibility: What is the underlying health of services? Architectural optimization: Are resources running at top efficiency? Configuration monitoring: What has changed and did it impact service delivery? 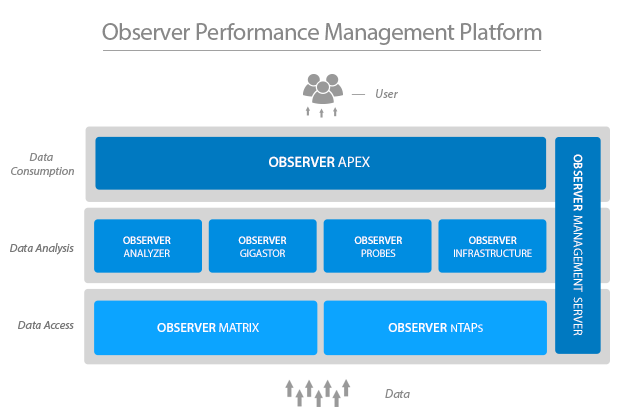 Observer Infrastructure (OI). OI provides the powerful real-time active monitoring and historical reporting needed to solve these difficulties and many more. It preemptively queries systems, applications, and critical resources to detect looming issues before they impact service delivery. OI transforms this sea of raw data into actionable information so you can prevent problems, optimize network performance, plan IT resources, and more. Plus data points can be summarized over time, providing deeper knowledge into trends that may impact current or future service delivery. Explore OI's robust capabilities with OI Free. Our no-strings-attached version is absolutely free, and easily accessible via a web-based browser interface and hundreds of pre-defined out-of-box reports. It offers comprehensive intelligence for thousands of critical operational metrics, with no add-on modules or 30-day time restrictions. Observer Infrastructure's real-time monitoring, coupled with its historical reporting, gives us information we use for IT planning, to optimize our network's overall performance, and to locate and resolve problems before they impact end users. Observer Infrastructure (OI) provides deep information into significant IT resources by usingadvanced discovery and polling technologies. It converts walls of data into actionable information through flexible reporting and intuitive mapping visualization. For exceptional polling capabilities, choose the Observer Performance Management Platform. A key component of the platform, Apex is the powerful reporting engine that unifies your performance monitoring solution. It not only works with OI, but also with the complete line of passive network and application management solutions like Observer Analyzer and the Observer GigaStor long-term packet capture device. When Apex is used with OI and GigaStor, you have even greater management IQ, including the ability to find the connection between seemingly unrelated service events. For example, if end users complain of poor response time, the Apex dashboard may show degraded IBM WebSphere MQ health. But if you drill down within the WebSphere MQ, your servers show excessive CPU utilization – the root cause of the problem. These details are all stored within GigaStor, but are easily accessed remotely with both Apex and the Observer Analyzer Console.